From the time the Japanese people became conscious of their own cultural character and traditions, the practices, attitudes and ideology that eventually developed into the Shinto of today. This religion had some of it’s influence from China, but it mainly originated in Japan. The religion is an ethnic, polytheistic religion. There are 2 branches of Shintoism: Sectarian Shinto, and State Shinto Religion. Diffusion- Originally Shintoism was created in a mix with Buddhism. Buddhism branched off of Hinduism and made its way up north from india. Then once it arrived in West Japan it mixed with the indigenous religions and created Shintoism. Then, through expansion diffusion it diffused to East Japan. In 550 B.C it was a very popular religion in Japan. In 1882 it became the national religion. Holy Places- Shinto Shrines are the dwelling places of the kami. Kami are gods or spirits that represent objects like trees, rivers, and the sun. The Fujiyoshida shrine is the shrine of Mt. Fuji. A very sacred shrine is the Ise shrine as it is located in the sacred forest of Ise Jingu filled with Japanese Cypress trees which are very sacred. Where its Practiced- Shintoism is only practiced in Japan as all the holy shrines are located there. 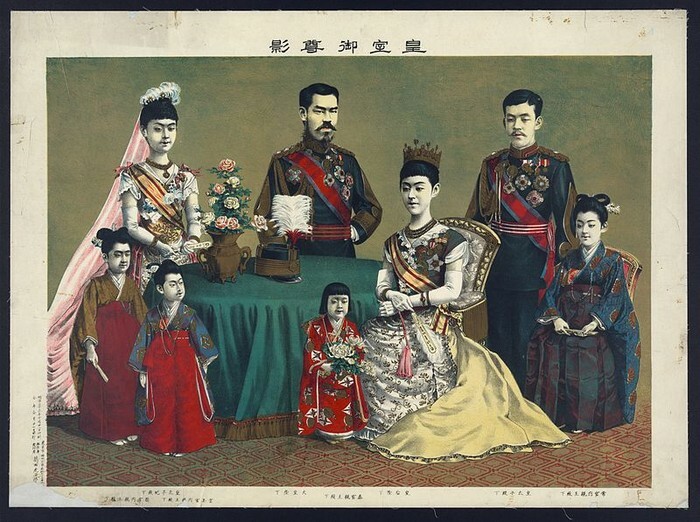 The Imperial Family (at the right) is particularly important to the Shinto religion. The Shinto worship the Sun and the Sun Goddess more than any other natural phenomenon, and the Imperial Family is believed to be ancestors of the Sun Goddess, known as Amaterasu. 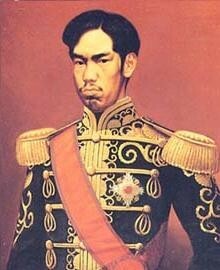 Emperor Akihito (see below) is thought to be the 125th descendant of Emperor Jinmu, Japan’s first emperor. 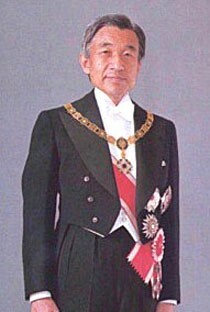 Emperor Akihito is also Japan’s current emperor. Emperor Meiji (1868-1912) (see below) made Shintoism the official religion of the Japanese empire. 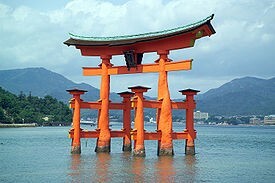 The Torii Gate (see below) is the most important religious symbol of Shintoism, and marks the entrance to sacred space. It signifies the finite mortal world and the infinite world of the gods. Shintos worship in shrines (see below). 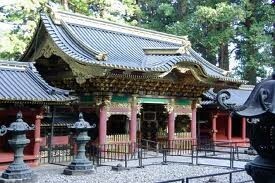 Shrines are the dwellings of the kami, or Shinto gods. People frequently visit shrines to pray to the kami for good fortune. The Shintoism religion is very focused on the worship of natural items. The deities, people, and nature are all in close relations. It is expected out of society to respect natural objects and to frequently visit the shrine to pray. People in Japanese society acknowledge that they share environment, space, and atmosphere with others. Families are very close to one another because of their acknowledgement of a shared home. Expectations for people are to respect and pray to their natural environment, as nature is very important to Shintoism. Purification is an important prospect of the religion, where deities, humans, and nature are brought brought to better order and balance. Purification ceremonies are regularly done when rituals happen. People are expected to keep their natural environment pristine, and not harm it. Another holy text of Shintoism. An important religious symbol to Shintos. How does Shintoism impact the Japanese people? BBC News. BBC, n.d. Web. 05 Dec. 2012. "Emperor Akihito." Emperor Akihito. N.p., n.d. Web. 05 Dec. 2012. "Emperor Meiji." Emperor Meiji. N.p., n.d. Web. 05 Dec. 2012. "Emperor Meiji." Wikipedia. Wikimedia Foundation, 12 May 2012. Web. 05 Dec. 2012. "FORE: Religion-Shinto-Introduction." FORE: Religion-Shinto-Introduction. N.p., n.d. Web. 06 Dec. 2012. "Glogster Home Page." Glogster. N.p., n.d. Web. 05 Dec. 2012. 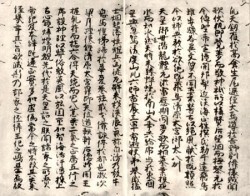 "Kojiki - Article of the Day - English - The Free Dictionary Language Forums. "Kojiki - Article of the Day - English - The Free Dictionary Language Forums. N.p., n.d. Web. 05 Dec. 2012. Punkochan. "Animated Tales from the Kojiki: Amaterasu Conceals Herself."YouTube. YouTube, 21 Dec. 2007. Web. 06 Dec. 2012. "Shinto." Shinto. N.p., n.d. Web. 06 Dec. 2012. "Shinto Shrines." Shinto Shrines. N.p., n.d. Web. 05 Dec. 2012. "Shinto Symbols." Shinto Symbols. N.p., n.d. Web. 05 Dec. 2012. "Shintoism." Shintoism. N.p., n.d. Web. 05 Dec. 2012. "Shinto." Wikipedia. Wikimedia Foundation, 12 Apr. 2012. Web. 04 Dec. 2012. Understand, the Apostle Peter who concluded: I most certainly. "Shintoism. "Jesus Who? Homepage - Learn about Jesus of Nazareth, obtain information about Jesus Christ, God's Son, humanity's Savior & Lord. N.p., n.d. Web. 5 Dec. 2012. "Torii." Wikipedia. Wikimedia Foundation, 12 Apr. 2012. Web. 05 Dec. 2012.